Andy and Rich meet up with good friend Capt Dave Chieffo from Block Island Charters for a night striped bass bite one eels. 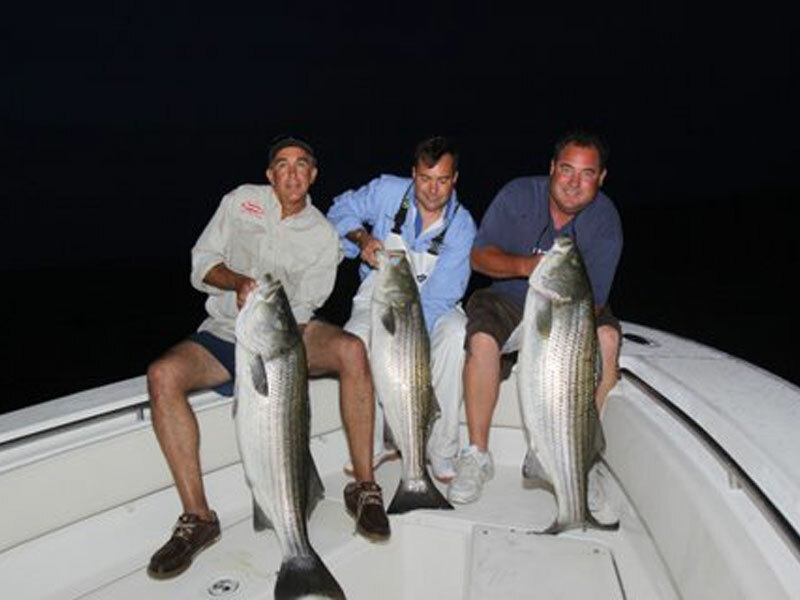 As usual the monster stripers at Block Island cooperate. They start out with some small fish, but as promised, as the night went on the stripers just kept getting bigger and things got more interesting. Only very light spinning tackle with little or no weight was used. The technique demonstrated in the show takes some practice to master, but is incredibly effective for catching the biggest stripers. The presentation of an eel free swimming to the bottom is impossible to match with any other technique or gear. Special note from the author – Filming for this show actually began at sundown and ended when it got too dark to film without using some serious lighting. This is a show we always wanted to do, but were very concerned that it would be poorly lit. Fortunately the fish cooperated and the crew was able to pull this off!